Knowing where the money is coming from, finding ways to spend it wisely, and earning more from it in between are all key to keeping your spending under control and making sure what you owe does not exceed what you can pay. You have probably heard the saying “penny wise and pound foolish” to describe someone who watches every little expense but is wasteful when it comes to larger spending decisions. You can be wise on both fronts! Consistently saving dollars on the smaller expenditures adds up, as does making wise decisions on larger costs. While this is not a glamorous topic, it is an important one. Who is paying and how much? We live in a time when the traditional way of funding a wedding—having the bride’s parents pay for the entire wedding and reception—is becoming impractical for many. As each year passes, fewer weddings are financed this way. While it is wonderful, and the couple should be grateful if her parents can pay for everything, it should not be expected. There are a number of reasons for this, starting with the simple fact that many parents cannot afford a wedding. Other reasons may be the couple is already independent or it is a second marriage. If you think about how the tradition originated, you can see how it has outlived logic. There was a time when a girl was a bit like property, “belonging” to her father until she married and moved into her husband’s home, where she became “his” and was expected to obediently perform her marital duties. Along with the bride came funds for the wedding as part of the dowry. Very few women today would stand for the nonsense of being treated like an object, so there is no reason to expect the financial requirement to stand as well. Consequently, one of the first things you must do after becoming engaged is have a meeting with parents and anyone else paying for the wedding, to discuss how much each is able to contribute. This may be uncomfortable to do, but it is an important step that allows you to focus on appropriate price ranges from the start. Once you have commitments from those footing the bill, your focus is on managing the funds in a way that makes you even more money from the dollars you will ultimately spend on your wedding. See Top Money-Earning Wedding Secrets for ideas. 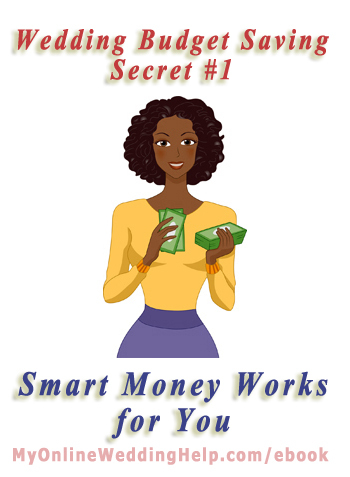 Throughout the Dream Wedding on a Dime; 7 Secrets for the Budget-Savvy Bride ebook I have marked select tips with “(Secret: Smart money).” These are ways to effectively manage spending your money. Go to MyOnlineWeddingHelp.com/ebook for more information about the ebook.